Forza Horizon 4 review: Best racing game ever? Moving the Forza Horizon series to the UK is a masterstroke, offering more varied terrain and driving conditions than ever before. There are also so many types of races and things to do that you'll never tire of its wares. It is the king of open world racers and a must-own for every Xbox and Windows 10 driving game fan. Er... dry stone walls shatter unconvincingly? They've had their ups and downs over the last six years, since the festival first rolled into town, but the Forza Horizon games have since overtaken their Motorsport stablemates for relevance and sheer enjoyment. Each outing brought something new to the party, offering incremental improvements and refinements, and although they also suffered from a few missteps along the way, developer Playground learned valuable lessons, both good and bad. Forza Horizon 4 is, therefore, the result of fine tuning and years of experience. It is the finest of the series for sure. Debatably the best racing game of this generation. Maybe even our favourite driving game, full stop. It gets everything so deliciously right; the almost simulation-style control, the keen attention to detail with every one of the in-game cars, the open world setting, huge variety in race styles, reward system with nary a loot crate in sight, even the customisation options for your avatar. Indeed, there are so many elements that are spot on we could simply just give you a lengthy list of what makes Forza Horizon 4 such an essential buy. But, while it's not the sort of game for spoilers, part of the joy is in exploration so instead of blurting on about the smallest things about the game that click, we'll concentrate on the bigger ingredients and let you discover the rest for yourself. The first thing it gets spot on is its setting. As with the former games in the series, the Horizon festival is back, and with it the chance for adulation and financial reward. Winning and even just placing in multiple different types of races earns you credits to spend on cars and influence to progress you through the game. 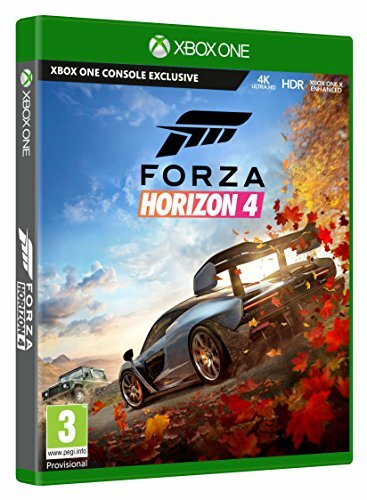 That's pretty much the mainstay of all the Forza Horizon games, but the fourth has a different location that changes much more than just scenery. This time the Horizon festival has set its stall in the UK, with a cunning blend of different areas of the country making up the largest open world Playground has devised yet. You get to race through the streets of Edinburgh as well the green and pleasant lands of parts of Britain - including what looks like the Lake District. Not only is driving on the left-hand side of the road somewhat unique in games of this type, but the dirt tracks, fields, country lanes and even beaches of England and Scotland are very different in style to the sunbleached landscapes found in the US and Australia. There's a heck of a lot more dry stone walls for starters. And sheep. They all make for an exhilarating experience where the terrain itself becomes a vital component in elevating this game above most others. Then you add different weather effects and seasons and you have something quite special. Seasons are the "big idea" this time around and they have a major effect on the game. Spring, summer, autumn and winter provide their own challenges, with rain, snow, hard ground and other specific signatures changing races into something different when they hit. At the start of the game, you play through a form of prologue, where you'll get to experience each of the different seasons in fairly quick succession - they unlock as rewards for getting a certain amount of in-game influence. Once you have finally progressed to a main season properly, so much more of the game unlocks - including full multiplayer - and you find that seasons only change once a week. Say you are playing in autumn, for example, you will get events designed specifically around that time of year. A real-life week later that will change to winter and the snow arrives. Then spring and so on. All the races you have unlocked are available across the seasons, which makes for longevity and more playability. This is the first Forza Horizon we've found ourselves replaying races we've already finished, because the same track drives very differently when covered in snow, for example. Or when it's teeming down. The last major reason why this sequel is so compelling is in its sheer variety of race types. Drift racing, drag, dirt, street, stunts - everything seems to be covered, ten fold. Once you've passed the prologue period your map looks like an over-enthusiastic Scout's shirt, the amount of badges and icons it gets covered it. There are secrets down almost every ally, with fast travel and influence boards to smash, and jumps to discover. And then there are the Showcase events, unlocked when you have a big enough in-game following. As in previous games, these are spectacular events, putting you in a specific car and tasking you with racing a different type of vehicle. We particularly liked racing The Flying Scotsman - a famous steam train - through the Scottish glens. And taking on a Delta Wing jet? Wow. These are made all the more stunning through the incredible graphics and sound engineering going on in Forza Horizon 4. The game runs at 1080p 30fps on the Xbox One S, and although we'd prefer a frame rate of 60, it looks great and moves brilliantly. There is also HDR for those with a compatible television, which gives everything a better, more realistic colour wash for sure. When played on an Xbox One X, things are ramped up a bit thanks to the extra processing power. You can choose between 4K 30fps and 1080p 60fps if you feel frame rate is more important than resolution. We prefer the 4K presentation, which is jaw-droppingly detailed and rich. Coming from the UK ourselves, we can vouch for its realism and it's great to see every tiny feature in the best clarity possible. The Xbox One X also offers HDR, of course. As we said, it would be near impossible to list all the things and features we like about Forza Horizon 4, so instead ask you to explore it yourself. If you like driving games, it is a must. If you even just admire technical achievements in gaming, there are few examples currently out there that look or move better. It is the pinnacle of arcade racers, considering it marries the simulation style control with madcap action beautifully. And it is a well-timed win for Xbox as a whole, at a time when its exclusives are hard to come by. Forza Horizon 4 is a must-buy for existing Xbox One owners and a jolly good reason to become one for those who aren't already.